We recently spent about a month in Salt Lake City, Utah, Ran When Parked’s home town. There is plenty to see, do, eat and – believe it or not – drink in SLC and there are a number of nature-focused attractions located a couple of hours away, including the Bonneville Salt Flats and at least half a dozen national or state parks. However, our favorite thing to do in SLC is to go junkyarding. 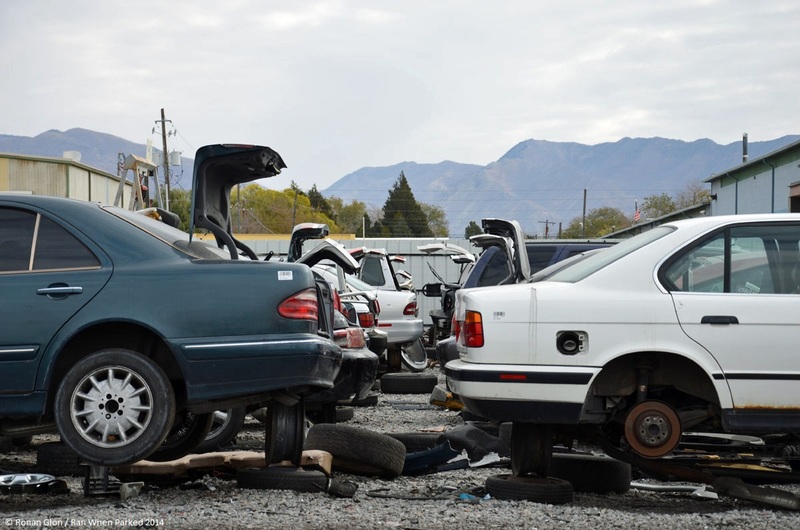 There are two large self-service junkyards in the Salt Lake valley and a third one located out by the airport. They all follow the same business model: you pay a buck or two to get in and you’re free to walk around acres and acres of dead, dying and decaying cars and dismantle anything that catches your eye. It’s like an amusement park for gearheads, and it’s all the more entertaining because you never know what you’ll find, especially since Utah is a predominantly rural state with lots of odd classics lurking in fields, barns, behind repair shops and so on. We photographed the cars below in the three aforementioned lots. Don’t rush out there if you see something you need – the pictures were taken in November so odds are all of the cars pictured are gone, the yards typically only keep them on the lot for about a month. Some of these cars have been featured in our Rust in Peace series over the past few weeks (including a 1960s Beetle, a BMW 1602 and a Volvo 164 E), and we’ll showcase a few more in the near future. Finally, the pictures might suggest that it’s always cloudy in SLC. It’s not, quite the opposite actually, but we made it a point to go out with our camera on overcast days because it makes photographing cars that you can’t move a lot easier. There are no shadows and you can get a variety of angles without shooting into direct sunlight. Tags: Audi, BMW, Datsun, Jaguar, junkyard, Mercedes-Benz, Rust, Saab, Volkswagen, Volvo. Bookmark the permalink. Previous post ← Open mic: What are your car-related New Year’s resolution? i wonder what the story is on the white towncar with fake rolls front end. and did the red 1970’s ford truck have a 300ci six motor. Apparently there are companies out there that make Rolls / Bentley conversion kits for Town Cars and other Panther platform cars. This is the first and only example I’ve seen in real life, thankfully. I didn’t check if the Ford had a six. Wow! What a nice playgroud!!! I can’t believe I haven’t been here yet!